Malcolm Arnold: March "The Padstow Lifeboat"
This fourth volume in AS&V's excellent British Light Music Discovery series concentrates on living composers. This shows that the tradition is still very much alive amongst the current crop of musicians and the music is indeed, quite charming in nature. 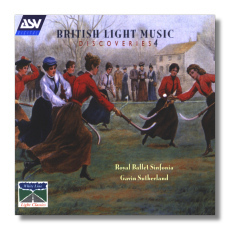 Rutter is better known for his ethereal choral works but the delightful Partita shows him in a rather more relaxed light, Richard Rodney Bennet's diverse style is evident in his picture portraits of the French countryside in the Suite Française whilst Malcolm Arnold's irresistible capability to turn out a good march (a common feature in this series) is demonstrated in the Paidstow Lifeboat sequence, a rousing piece that is shamefully under exposed. I greatly enjoyed David Fanshawe's haunting description of Windsor Castle and the subsequent 'Battersea Park Suite' by Blezard, each little movement brings to life the characteristic charm of this much loved area. The final two pieces are effective light works that have a loftier goal in sight. Michael Hurd's Dance Diversions recall Rachmaninoff's Symphonic Dances whilst Paul Lewis' Miniature Symphony manages to say it all in four movements that last five minutes exactly! Gavin Sutherland and the RBS are charismatic and infectious exponents of these works whilst copious notes on the composers pack the booklet. Incidentally, the front cover shows women playing a relaxed 19th century game of hockey although the original advertisement featured a horse race! Will that turn up in Volume 5 please?